Well, I have only been doing FlyLady for a few weeks now and I have been good at shining my sink. Recently, my husband has seen me do all this cleaning and he thinks that shining my sink every night, filling it up, putting bleach in it is a BIG waste of water and also our water heater. I told him the reason why I do it is so I have a clean and nice shiny sink to come to in the morning. He told me that it’s a complete waste to do it every night and instead I should do it every 3 days or so. Is he right? Is he wrong? Is there a way to explain it to him easier? I would love to hear your advice. I really hate to say this but your husband is right. The Shiny Sink 101 treatment with the bleach is for the very first time you shine your sink. You see, when our homes have been messy for a while, our sinks are usually really bad and need to be sterilized. Once you have gotten it the cleanest it can possibly be; then all you have to do every evening before bed is to take some window cleaner and your dishtowel or purple rag and just shine your sink. This is really just drying your sink out so that water spots don’t leave calcium deposits on your sink. I know some of you don’t like window cleaner; so using a little vinegar is ideal for those water spots. What I want to address is why you thought you had to fill your sink with bleach water every night. This is your perfectionism. You are afraid you are going to mess up. The only way you can mess up is being too hard on yourself. Once your sink is clean and shiny; you will rarely have to do the bleach water step. If you cut up a chicken in your sink; you may want to sterilize it afterwards. I applaud you for your determination and the fact that you are celebrating your successful shiny sink. Please tell your husband that I apologize for not making this first step a little clearer. If the truth be known, I have only done Shiny Sink 101; two or three times in fifteen years. My hot soapy dish water helps to keep my sink shiny. Every evening after the dinner dishes are done; I wipe my sink out with my dirty dish towel and put it in the dirty dish towel hamper. Then I put out a clean dish towel and dish rag. I turn of the lights and settle in for the evening. This is also when I put on my pajamas and take off my lace-up shoes. Now it is time for you to tell your husband and enjoy a laugh. It is fun to laugh at ourselves. If you have not shined your sink yet then please start today! 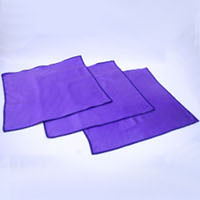 Do you have a set of purple rags yet? You are going to love them. Purple Rags shine everything! I have one in every room of our home. This entry was posted in Ask FlyLady and tagged ask flylady, calendar, flylady, get organized, organized, Purple Rags. Bookmark the permalink.